did a couple of sketches on Iron man..back then..
and the latest is the ironman vs ironhide..
not a big fan of ironman..
but when the news came out on Ironman movie..i was hooked! didn't collect any comics on iron man..
but..Ironman:enter the mandarin really get my attention..thanks to eric canete marvelous art! well ..till the movie come out. now that i can relaks a bit..
so time to do other job..and life is normal again..so can did some sketches & doodles..
letih wooo nak buat event ni...for free demi komik Malaysia..
this a sketch i did when testing berol marker before buying it.. hoping that i can ink as good as Eric Canete, paul Pope and Jeff Smith..
regarding the PeKOMIK minikon..so busy i didn't announce it here..
And just like that, PeKOMIK's first ever mini-convention is over. It's really a worthwhile event that makes you realise the joy and pride of being a comic creator/cartoonist/comics publisher. 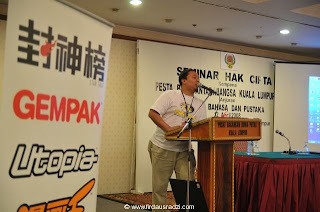 Many of the PeKOMIKON organising committee members themselves could not attend the informative panel sessions in Kedah/Johor room because they were manning (or wo-manning) various PeKOMIK booths outside the room, sacrificing their time and potential knowledge gain just so others were able to benefit. The whole team behind PeKOMIKON -- Jonos, Ruby, Azhar, Batmanbegins, Fieza, Nurie, Dinjerr, Prem, etc, -- deserves a big round of applause. It ain't a perfect event, but there's a lot of passion and love that went into it (no, I haven't been watching any romantic movies lately!). And many of them were still at PWTC long after the convention ended (this was at 8.30pm), dismantling the "illustrators portfolio showcase" gallery. The tapes used to stick the artwork to the panels could be real tedious to wipe off and did try my patience. Correct me if I'm wrong, but I believe today (Sunday) saw the best attendance during the whole PeKOMIKON. 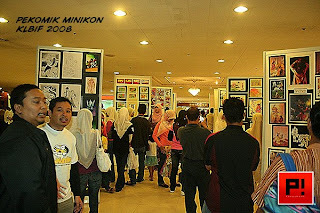 The hall was almost totally packed during the PeKOMIK launch and National Illustrators Conference. And why not? You had veterans like Lat, Jaafar Taib, Zunar, Reggie Lee and Pekartun president Tarzidi gracing the event. 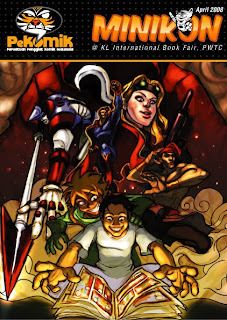 And the PeKOMIKON also attracted people like Ujang, Imuda, Gayour, Milx, Tan Eng Huat, Chee, Lefty, Slaium, Kerengge, Ubder... the who's who list goes on and on. 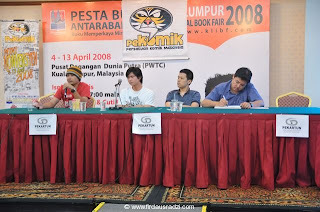 One of the questions asked of the first panel, comprising Lat, Jaafar Taib, Zunar and Tarzidi, was regarding illustrators not being given recognition in children's books such as on the cover. Anyway, I sensed that the panellists might be a bit skeptical of the study, which only covered about 100 people. They might be too polite to refute it pointblank, especially since the chairman/emcee Zamri stressed it was a "large" number. Zamri also went on to say he encouraged illustrators to "fight" overseas, in places like the US and Japan, due to the treatment of illustrators in this country. Zunar was quick to point out that going overseas would never solve the problem in the country. He said there were issues to be resolved internally like copyright, and he proposed a bigger seminar (than the National Illustrators Conference) that involved all parties concerned: artists, publishers, the government, and lawyers. Jaafar Taib said the problem of copyright and royalty had existed even 30 to 40 years ago when he first started in this business.He asked that people not be confused about copyright. "If the work has been decided by the publisher who says 'I want this concept,' etc, the assignment is being given by the principal or publisher. It's like the government assigning an architect to build a building. The architect could not declare that it is his copyright. "The artist is similarly employed by the publisher. "If you complete something from your own idea and bring it to the publisher, are you willing to keep the copyright or sell it for a big gain? If you sell it outright, you bear no risk. The principal bears the risk (if the magazine/comic fails). But if the work is popular, then the artist starts to feel he has made a loss. Hence the complaint arises, 'I don't get royalty'. If you're brave to take the risk, only then will you get royalty. "In the case of school textbooks, in which the artist's role is 75 percent of the story or selling point but his name is not on the cover, logically if the royalty is 10 percent, the illustrator should get 7.5 percent while 2.5 percent goes to the writer. Royalty distribution must be fair." 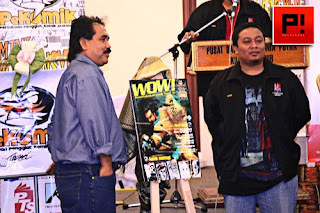 He continued: "Look at P. Ramlee's works. Who does the copyright belong to? We cannot sigh (with regret) because everything was agreed upfront by P. Ramlee." despite my soar & dry throat, cough and squeeky husky voice..the show must go on..
Pami (Gemuruh) then asked the panel about the need for a fixed minimum rate for a piece of illustration work. Lat answered (I'm translating his reply from BM so hopefully I got it right): "Hopefully we don't think too much about the issue of copyright until the point of being incapable to even make a drawing. What is important is that copyright is already ours. Why must the issue arise in the first place? "We should be involved in negotiation (with the publisher). The most common is to have a letter of agreement. We have to remember that the copyright is ours unless we work on assignment. 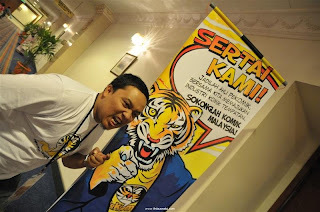 "The copyright for my cartoons in NST belongs to mee but I give them publishing right for a certain period. What's the point of NST holding the right forever? So, just give it back to me.... "We have to get everything in black and white from publisher if we want to ensure that when our creation becomes famous, they would not do unauthorised merchandising.... Nothing can stop us from negotiation. Lat mentioned an arts guild overseas that has set a minimum rate, but he said it was only a guideline (not cast in stone). He said it might help first-timers, to give them a guide. "But the real guide is in negotiation with agencies. Don't be shy; it's not even their money but their agency's money. "Creative work is from our mind and everyone has different types of creativity. That's why I don't want too many of our people drawing (the typical) manga because if everyone's work looks the same, it'll be hard for us to put a value on our work." Lat said that to avoid being cheated by publisher, the artist must negotiate and sign an agreement. For a start, the agreement can say, "I'm drawing this assignment for X payment and the copyright belongs to me." "But we also have to look at how important that work is," he added. "A beginner must learn to give and take because many people do not know him yet. What's important is midway through the career. "If you're asked to draw something for RM200, do an artwork worth RM200. Don't give a RM2,000 artwork for the price of RM200." 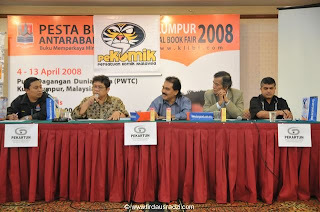 After Lat's speech, PeKOMIK president Azhar said PeKOMIK will produce a guideline for first-timers and publishers. After that, Reggie Lee was invited to give a comment, and he said: "Do it from the heart and not for the money until you're established. It's really a worthwhile journey to work straight from the heart." 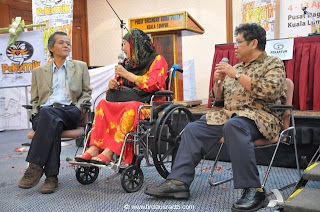 Later, during the reunion event in the afternoon, one of Malaysia's earliest comic artists, a lady named Puan Nora Abdullah (that's her pen name -- her real name, if I remember correctly, is Nik Nor Zaharah), gave a talk. 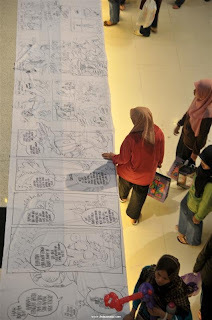 She started drawing comics (in jawi) when she was 13 or 14 (in 1954), guided by an artist from Thailand. Puan Nora is probably known most for her "Duyung Mas" comic, which she continued in the 1980s in "Fantasi". That was her last published comic work. Last year there was an exhibition of her portrait paintings done when she was in her 20s. Puan Nora, who is in a wheelchair and now uses a magnifying glass to read, used to draw in a kampung where there was no electricity. She drew up to four pages at night by candlelight, until the wax had all melted. She was married at age 14, and her late husband (he passed away in 2006) encouraged her hobby. She got paid RM60 per comic at first, and later RM120.On whether she asked for a higher rate, she said: "Saya tak nampak pada duit masa itu, mungkin sebab saya dah berumahtangga. Saya buat dengan ikhlas. Kalau bagi RM30 pun, saya rasa cukup." I find her story inspiring. 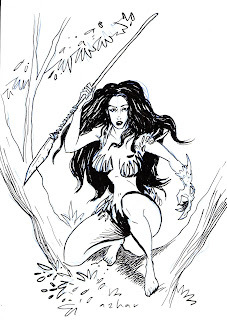 I didn't know there was a female comic artist in those early days, and she was driven to pursue her craft amid traditional upbringing. Here's a woman who shows that being married does not mean that you have to give up your dream. She also raised five children. She was a pioneer among women artists and a pioneer in the industry as a whole. I think if you didn't attend the afternoon session today (Sun), you missed something quite special and rare. 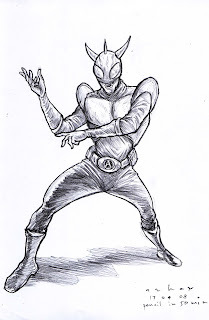 Anyway, I still imagine Malaysian artists getting together and creating something like an Asian Marvel Comics. Maybe it's just a pipe dream. I was surprised to learn that Don only got only 4 hours of sleep at night (if he's lucky) when he is working on a comic project. As you guys know, Don is drawing G.I. Joe comics written by Larry Hama for a Hasbro toy line. Don has a day job and married with kids, so he's drawing in the little free time he has. That's dedication! "Luckily there's a 2-week gap between comic books so I can get a breather," he said. Well, Don, glad you could at least make it to the PeKOMIKON this year despite your tough schedule! :) I'm going to wrap up my report now. If I made any mistake in my report above, I hope someone who attended PeKOMIKON can correct it. I'm kinda writing this when I'm very sleepy, just hours after the PeKOMIKON, so I might have made some errors. If so, forgive me.